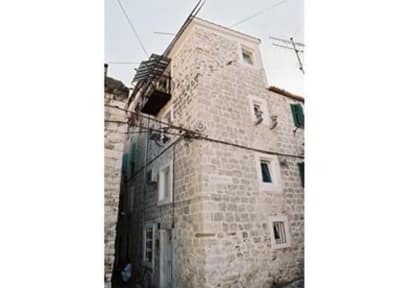 A wonderful old house newly renovated in the very heart of Split's UNESCO protected old town. Each room is on separate floor and it has own bathroom, air-conditioning and flat screen cable TV (except the single room has ceiling ventilator). Newly renovated! New furniture. Free WIFI! There is kitchen to make yourself tea or coffee. We offer 2 double rooms en suites and 1 single room en suite. 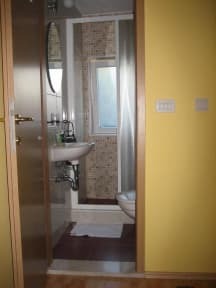 Location is very central about 2 min to the Diocletian palace, Riva, airport bus station, the port and close to the main attractions. In easy walking distance of many restaurants, cafe bars and shops, it is ideally situated for anyone who wants to explore Split and it's surrounding islands. If you are looking for a places just to sleep at night and like me are going to spend all the days and night out and about exploring then this place is great. Nice central location close to the palace and sea front. Could be a bit noisy with the little restaurant right outside the window but was generally pretty quiet by the time I got back at nights. Everything about this little studio apartment was fantastic. Great location, clean, and a good value for money. My one complaint is that the owner was overly protective of the property. She even came in, unannounced, to make sure I wasn't "tearing up the place." Her reasoning was that she saw a group of people coming into the apartment, when I simply had one friend over for a drink. Other than that, it truly was a great place to stay. Amazing location, room is really nice and clean however kitchen isn't quite so clean and found a few different insects throughout our stay ( to an extent that's unavoidable but the bin has no lid so there's a slight fly issue ). The owner is reasonable enough however she did try to overcharge us slightly both times we stayed (feel like she wasn't taking into account hostel world deposit) although that was rectified. For the price I really can't think of a much better place and location. This is centrally located once you know where it is it's easy to find. The room was very small and the bathroom was clean but very small also. The staircase was very narrow, winding and difficult to navigate. The owner was very pleasant and waited for our late arrival.